Add another camera (for level), move it along with hero. Luxe already have built-in tilemap, so at first I decided to try it. I don’t found any documentation or examples how to use Tilemap directly, instead of every example of tilemap use TiledMap to load map from file. TilemapVisual, OrthoVisual and IsometricVisual – renderer for map. BTW I still tried it – works well and fast. OK, for the first time I tried to use Sprite for each individual tile. It has uv property, so I can point it to appropriate tile image inside tileset. It works, but very-very slow. WTF? 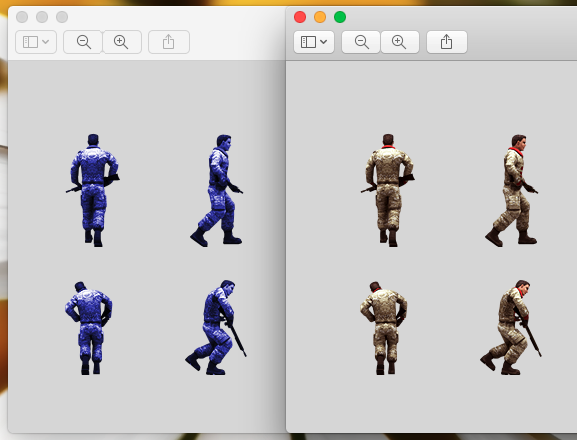 Tileset works fast, but bunch of sprites – slow. While I’m digging in built-in tilemaps, I didn’t find something special, that should speedup rendering. But it was. I previously had a lot of experience in OpenFl. So, in OpenFl, if you want to display something, you should add it to display list (eg. on stage or as child of another display object). Initially, I thought that scene in luxe is something like stage in OpenFl. But it is not true. A closer analogue of OpenFl stage is batcher. Scene is container for entities (ECS), it listen for game events (eg. mouseup, mousedown, etc. ), and emit them to child entities. Entity is one specific game object, it can handle game events, it can have components. But also it has transform, pos, rotation, scale and origin properties. This is confusing. Visual is entity which have geometry, and which can be displayed on the screen. Also it set geometry transform parent to entity transform, so you can change entity properties (eg. pos) to change actual geometry position. Sprite extends Visual and adds support for uv and flipping. Geometry is something visible, for example Visual by default create QuadGeometry. There are much more geometry variations (eg. LineGeometry, CircleGeometry, RingGeometry, etc.). Batcher contains display list of geometries (actually balanced binary search tree, sorted by depth and several other properties). Batcher is that guy, that renders everything. I don’t need Entity capabilities for each individual tile, so instead of creating Sprite and adding it to Scene, I should create Geometry (to be exact – QuadGeometry) and add it to Batcher. TilemapVisual – Visual with 2d map of tile geometries. That was quite easy part, because I already has code for reading level in Java (from GD2). I just rewrite it in Haxe. Rendering objects, doors hero and enemies is easy part too, because I already have TileVisual. One unexpected problem was with hero graphics. Because Gloomy Dungeons and Gloomy Dungeons 2 is 3D shooters – you can’t see protagonist, so there is no graphics for him 🙂 I used my photoshop mad skills in Photoshop, and just change color of first enemy.